Starting off class with a conference room meeting! When I started thinking about how to incorporate this into upper elementary, I looked at what skills the kids struggle with and need the most reinforcement. To start off with, I decided on character traits (which is really also increasing student vocabulary), greek and latin roots (hello, vocabulary! ), and idioms (which aides in comprehension, especially for ELL). 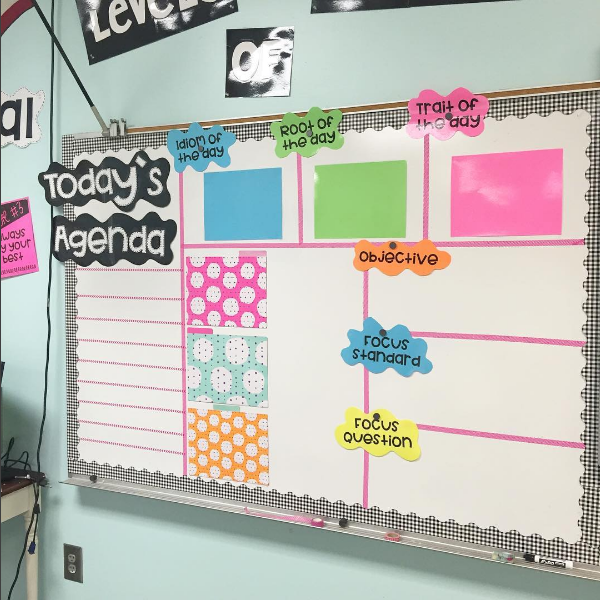 I combined this with my agenda board ( a list of daily tasks that need to be completed during that day's lesson) and the focus question/ lesson standard/objective and came up with a meeting board that is perfect for starting off each class! I finished this board last night and I'm so pleased with how it turned out! So how do I plan on using this board? The student that leads the conference that day will display a new idiom, root, and trait and announce each new addition to the class. They will tell the others what standard we are covering and what our objective is for the day, along with the question that we are focusing on. I really want this to be student led, so I'm hoping this process works! The folders in the middle of the board will hold the daily papers for "Root of the Day", Idiom of the Day" and Trait of the Day". This way the student leader of the day will simply reach into the folder and place the new addition to the correct box. Now, we all know that we can create the perfect area and the perfect board setup, but we have to hold the students accountable, right?? That's where the interactive notebook pages come in! I'm going to have students come to the "conference room" everyday with their notebook that will be set up to follow the board. That way they will be accountable for the day's addition and be able to have a reference tool to look back at. Let me know if you want an example. This is an awesome idea. Yes I will like an example. I would love to see an example. My students also could benefit from these daily skills. An example would be great. 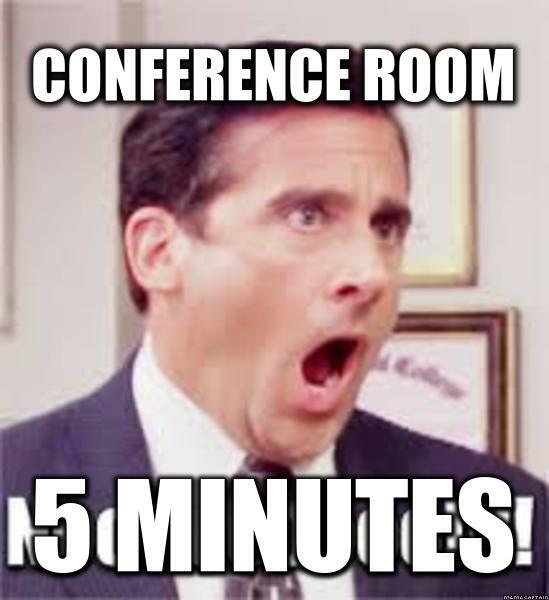 I'm a first year teacher and I'm setting my classroom management in a "business type" setting (they get paychecks, sign a contract, have jobs, badges, etc) so a "conference room meeting" would be a great addition. I would love to see an example as well! An example would be great! 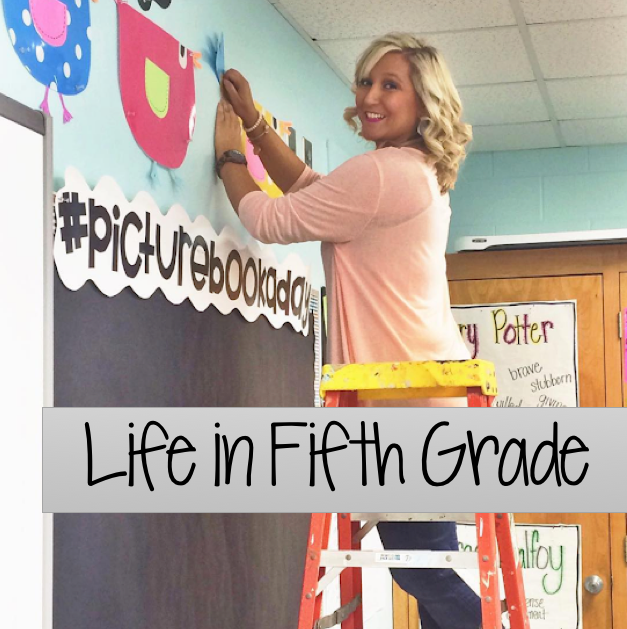 I love this idea...we found idioms to be difficult for our 4th graders last year too. An example would be great. Thank you!! I love this idea! I love how much "student talk" there will be! I would love an example of your interactive notebook page that goes along with this :) Thank you! I love the student lead idea. I would also like a video example if at all possible. Thank you! Yes, an example! I love that this is student led! How much time do you give to this each day? I love all of the ideas you are posting this year! I purchased your root resource, and I have a quick question. Do you change your board when you post a prefix instead of a root or do you just call all of the resources in your packet roots? Thanks again for all you share and do! So, is this for a classroom that just teaches ELAR? If not, do you erase and put up the next subjects question if the day etc? So, is this for a classroom that just teaches reading? If not, do you erase the question of the day etc and write the next subject's info? Do you teach more than one class? How would you use the board for the other classes? Sweet! Please share your example with me. Love, love, LOVE this! Such a great resource for primarily English speakers AND for my primarily ELL classroom! I'd love to see your example! Do you have the Root of the Day and Idiom of the Day in your TpT store? I found the traits. Thank you! Yes, would love to see an example! I would love an example, also, please. Yes, I would like and example. Will you put all 3 on the same page? Will the glue it in? Are the new pages in the folders and the student replaces and adds each day? Thank you for helping. I know it's stressful just getting yourself ready, so I'm do glad you're helping us too!! What a great idea. I'd love to see an example !! Katelynbarrett11@gmail.com thanks so much ! I love this idea. I am going to tweak it a little and make it a math meeting board using fact of the day, and depending on standard, standard fact of the day, and word problem of the day. When I finish, I will try and send you a pic. I would love an example or a video of it in practice. My email is katstewart77131@gmail.com. Thanks so much! You are awesome! Please send me an example bc I’m taking over a 5th grade classroom for 9 weeks ( beginning next week)and I need all of the help I can get)! I do love this idea. I would love an example! Thank you! I am coming late to this party but looking for ideas for next year. I’d love an example. Prettia27@gmail.com thank you!! I love this idea and would love to see an example! Thanks! I would love an example!! I LOVE this Idea!!! May I please get an example? Would love ❤️ to see an example of your agenda board! Thanks! Would really love an example!!!! I would love an example!! This is such a great idea! I would love an example! Love this idea! I would love to see an example, please! I love this! Would you still be able to send an example to floydm@rcschools.net? Thank you! I love this idea and would love to see an example! Would like an example, please and thank you!